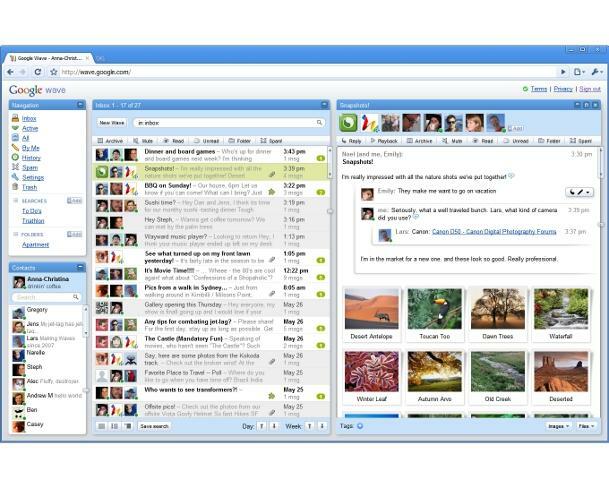 Google released to developers an early version of a collaboration and communication tool that consolidates features from e-mail, instant messaging, blogging, wikis, multimedia management and document sharing. That Wave ranks pretty high within Google's plans is evidenced by the starring role it is getting at the company's I/O developer conference. Thursday's keynote was devoted entirely to Wave, with the two project co-founders and its product manager on stage giving a lengthy and detailed demo of the tool. Ernest Lombardi, a Web developer with Sapphire Technologies in Portland, Maine, was "blown away" after sitting through the keynote. "It's simple, genius, and most importantly open. Watching the presentation, I had visions of Wave having an impact on everything from academia to collaborative fiction to the legislative process at state and federal levels," Lombardi said via e-mail. Lombardi already envisions a variety of ways in which Wave could be useful to some of his clients who are interested in collaboration, community building applications and social networking-like interfaces. He believes Wave has big potential to be revolutionary. "Wave is aptly named, since it has the potential to wash away what we now consider to be the Internet. It is not difficult to imagine the net as we know it becoming an ever-expanding archipelago of Wave-based islands," Lombardi said. Gartner analyst Ken Dulaney, who is attending I/O, is very impressed with Wave. "This is one of the best product concepts I've seen in the past five years," Dulaney said. It's clear that Wave represents a significant evolution for Internet communications, particularly e-mail and IM, and Gmail users will in time migrate to Wave, he said. Makers of competing Webmail and IM services will have to respond with Wave equivalents, or else their users will also switch to the Google product, Dulaney added. However, Wave's appeal extends beyond e-mail and IM, since it also offers a wide variety of other functionality, like blogs, wikis, photo management and document collaboration, and can be extended broadly by third parties thanks to its open architecture and APIs, he said. "It glues together a lot of things that have until now been separate products," Dulaney said. "This is where users will want to be." Wave is built on Google Web Toolkit using HTML 5, the latest version of the Web's markup language, and has a set of APIs designed to let developers extend its functionality and integrate it with other Web services. The protocol underneath Wave is designed for "open federation" so that the product is interoperable, and Google plans to launch the Wave code as open source.